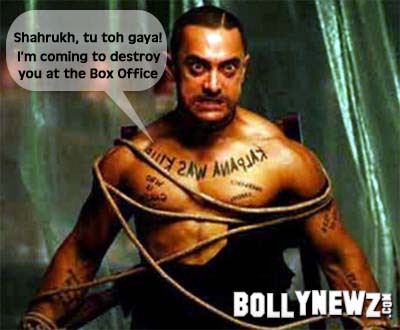 Aamir Khan is all set to destroy Shahrukh Khan at the Box Office in less than 2 weeks. If you go to watch Rab Ne Banadi Jodi at Multiplexes, chances are high that you might come across a life sized doll of Aamir Khan… just like the SRK’s Madame Tussad Wax Statue…. in total Ghajini look… Six Packs, tattoos and all.. If you are still not interested to watch Ghajini, Aamir has started his own Ghajini Army. You can see the staffs of Multiplexes in Ghajini hair style… yeah, road on your head look. I don’t think audiences are so stupid to watch the movie just because they see life sized dolls and Ghajini hair styled multiplex staffs. Ghajini has its own selling point - Aamir Khan. So the producers of the movie are wasting the money on such things. Anyways, it is hard to tell the fate of Rab Ne Banadi Jodi in coming weeks because of mixed reports, but Ghajini is all set for a bumper opening.